Rusty elevator pitch, mental resume and personal contacts? …Thinking about it. Casual wear, business attire — oh, and the jammies? …Packed! Your hopes and dreams, and your parents’, family’s and friends’ hopes and dreams for you? It’s gettin’ REAL! You’re feeling quite nervous, but that takes second place to your anticipation and excitement. You’re in Hotlanta: the dynamic and historied birthplace of both MLK Jr. and Trap Music, home to the world’s busiest airport, top five city for the most Fortune 500 headquarters, and global enterprise playground for students matriculating at Emory University’s top 20-ranked Goizueta Business School. You’re here to witness how all this comes together to manifest the perfect environment and vehicle for your professional Level-Up! The planning is done, and it’s finally time to launch this thing! All events are set, spaces reserved, and Goizueta student volunteers ready for the weekend action. We anticipate their arrival while reminiscing about the laughs and anxieties we experienced as IG prospects of recent years past, and we’re energized to put on a good show for next year’s potential incoming class of diverse leaders. We’ve had a year or two inside these GBS walls to reflect on our own personal journeys — our struggles, our jobs, our career goals, our resilience. We remember the GMAT, the essay writing and rewriting, the introspection and maybe even the number of failed attempts at completing an MBA application. We remember the MBA programs we chose to pursue as well as the ones we didn’t. Most of all, we remember how important it was that the school we’d choose had an ingrained and genuine commitment to diversity. With appreciation and respect for our various paths to business school, through IG, we’re ready to share, coach, guide, congratulate and support those coming up right behind us! Inside Goizueta took place over three days, Thursday through Saturday, November 8-10. It’s the business school’s annual prospective weekend event for diverse leaders seeking career advancement through business education. From careers in banking to nonprofit, technology and entrepreneurship, these accomplished individuals are also making a notable impact in their communities — communities which are often underrepresented in entrepreneurship, business and other corporate ventures. Selected IG prospects were invited to GBS to get a personal look at how Goizueta MBAs live, leveraging the school’s community, network, resources and location to ensure post-MBA career success. The event is meant to help MBA prospects better assess their fit into GBS culture, build an MBA recruiting network amongst each other, and make valuable connections with current GBS students and faculty. 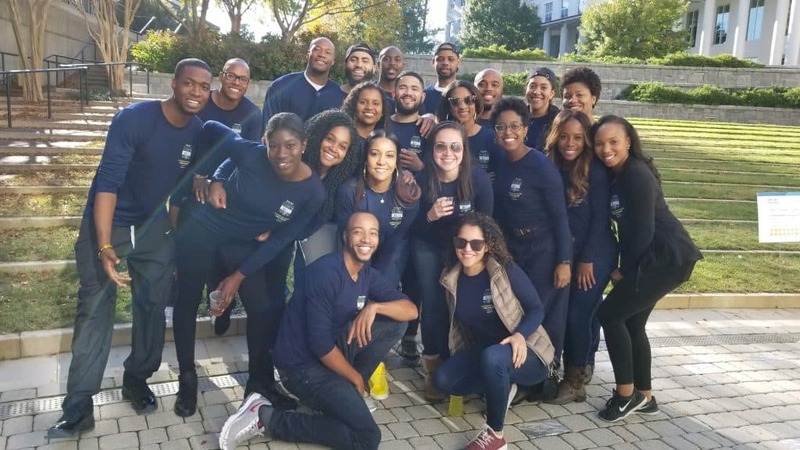 To make sure prospects got the full “inside,” this year the IG planning committee incorporated snippets of all Goizueta has to offer, including its academic prowess, student affiliations and clubs, and the city of Atlanta. We kicked off the weekend with a meet and greet, pairing prospectives with current student weekend “buddies” who welcomed them onto campus and led them to the commons to experience K.E.G.S. with us! Responsibly, of course. The IG participants mingled with GBS’s centennial 2019 and 2020 classes before attending their introduction led by Assistant Admissions Director Shanice Brown and the 2018 IG planning committee. The night ended with fun, games, music and bowling at the Emory Conference Center hotel. The following day, prospects immersed themselves into campus life, engaged for current student and alumni panels that spoke to various aspects of the GBS MBA experience — application considerations, apprehensions and, of course, career impact. Multiple GBS students opened their apartments and homes to host groups of students to see how we live, later ending the night out on the town at Suite Lounge. Before wrapping up the next morning, the IG participants enjoyed a farewell breakfast and many well wishes from those of us not too far removed from where they currently stand. Inside Goizueta 2018 was a great time, not only for participating prospects, but also those of us who’ve experienced it before matriculating! A Maryland native obsessed with magic! After holding various R&D scientist and engineering roles within government and pharma, Lumeh’s positioning herself to better connect, develop and empower innovators. With a passion to realize and accelerate tomorrow’s advancements (“magic”) in technology and research, she’s focusing on human capital management: training and development, diversity, and strengthening the STEM talent pipeline. Prior to pursuing Goizueta’s One-Year MBA, Lumeh earned her bachelor’s in biomedical engineering from George Washington University and her master’s in materials science and engineering from Johns Hopkins University.